Rugged, green-inspired and contemporary bands provide soon-to-be grooms with wedding ring choices that remain true to the tone of wedding vows while offering a casual, understated appeal. 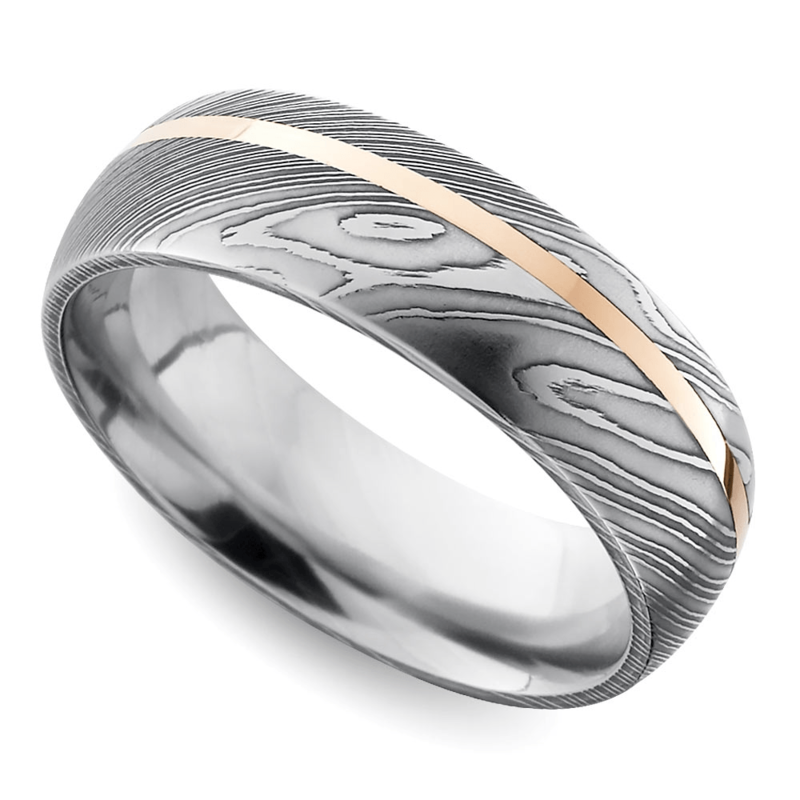 Many men gravitate to the simple gold band, but a vast selection of unique wedding ring designs provide numerous options for men to dodge tradition. Wedding rings should reflect individual style. Men who favor t-shirts and jeans on casual weekend outings should choose a ring that matches their laid-back lifestyle. A more traditional groom may prefer an antique men’s wedding ring, while a buttoned-down, fashion-forward groom needs a ring that offers a sleek and contemporary design. 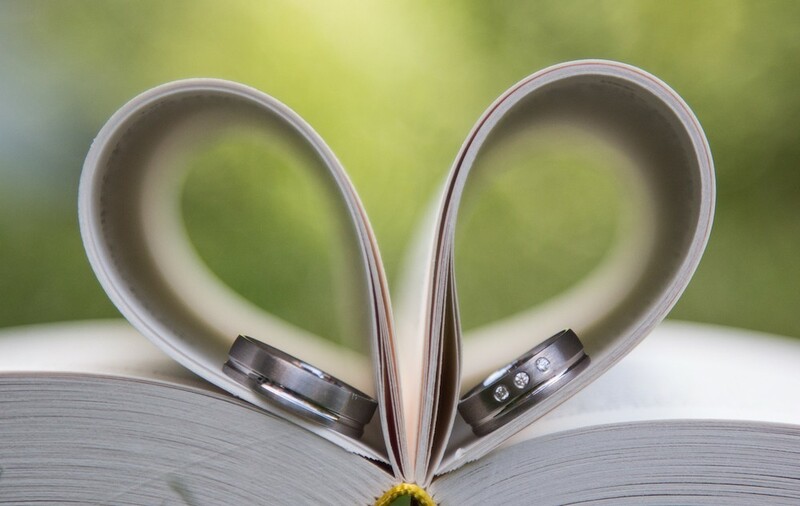 A wedding band should never interfere with your everyday lifestyle, and a man should not feel the need to remove his wedding band for fear of damaging the ring. The right wedding band molds with life and its presence should be unobtrusive. Choose the band that meets the needs of life, and seek out a design that stands out from the ordinary and makes a statement at first glance. For the man who holds a secret fondness for the screeching and sharp-clawed velociraptors, opt for a ring straight out of Jurassic Park. The beveled blue dinosaur bone band in tungsten brings prehistoric inspiration to the wedding. Featuring an inlay of blue-hued genuine dinosaur fossil, the band is designed with beveled edges for a contemporary appeal. Just please don’t try to harvest the DNA to create baby dinosaurs…while all rings are protected by the Brilliance lifetime guarantee, we do not protect against smashing the fossil to extract DNA. Ready to launch in 5…4…3…2…1…. Who didn’t dream of being an astronaut at some point in their life? 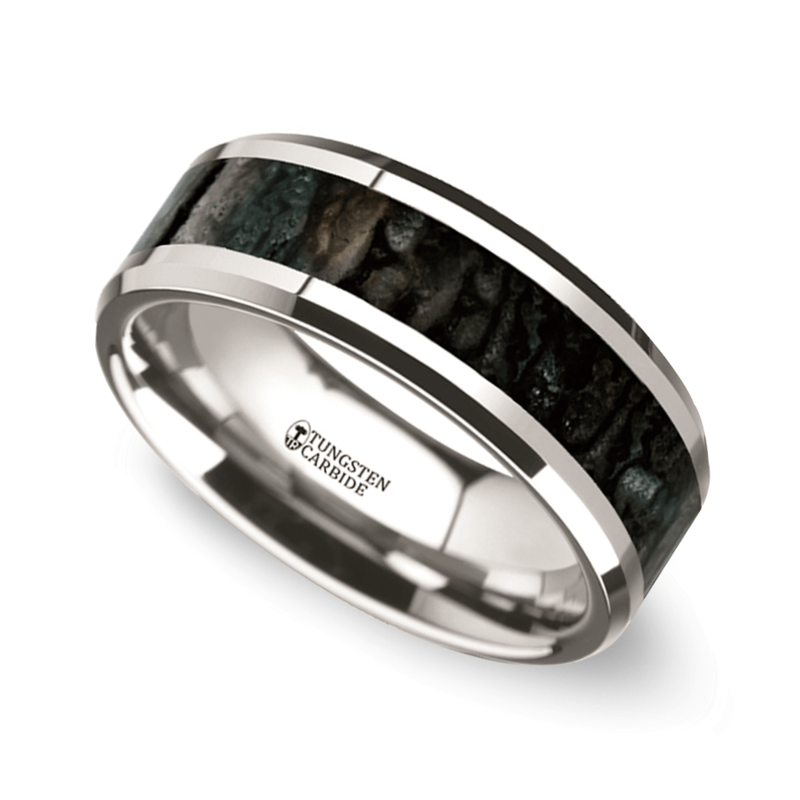 For a man who never lost the love of the unknown, give him a piece of deep space with the flat-satin men’s wedding ring with an inlay of genuine Gibeon Meteorite. 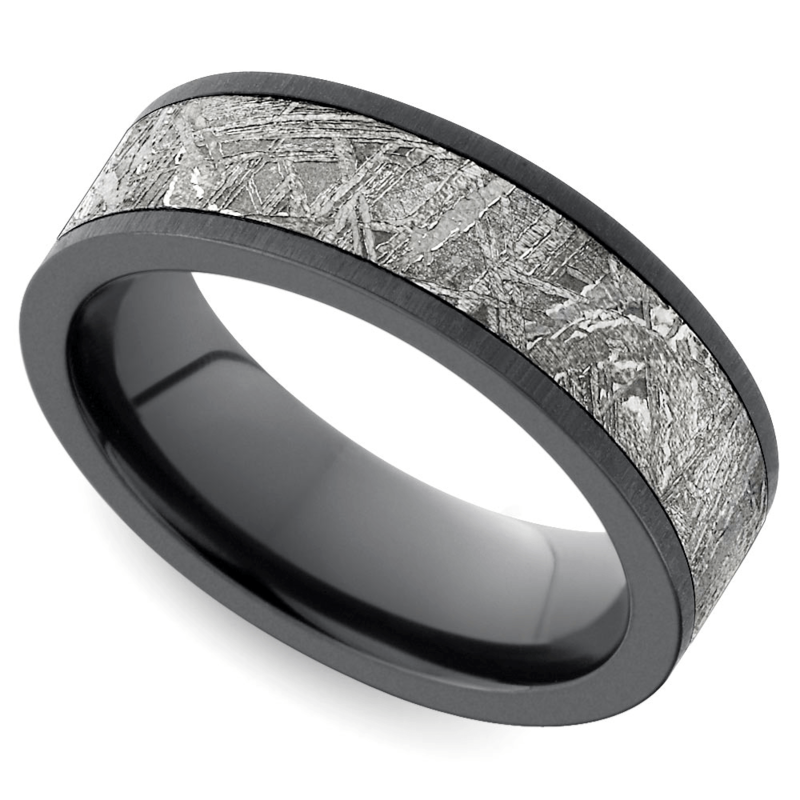 The black zirconium base makes a seven-millimeter band contrasting with the rugged, gray meteorite. The jet-black metal resembles the dark sky, while the intergalactic meteorite darts across for an out-of-this world effect. Carbon fiber is used in race cars, aircrafts, turbines…and also wedding rings. Now he can have a piece of aerospace engineering on his hand. 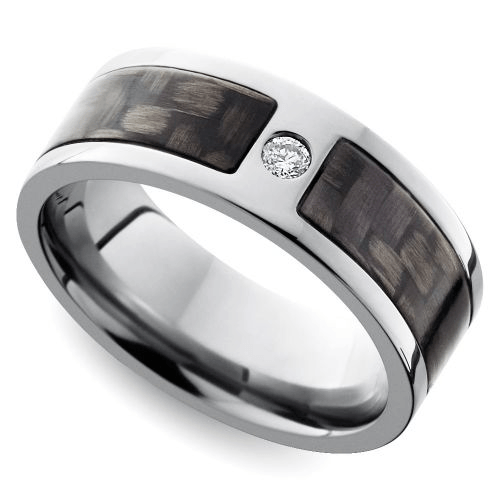 The diamond accent carbon fiber men’s ring combines masculine appeal with a sleek finesse. Set in titanium, the band features a small solitaire diamond between an inlay of woven carbon fiber. Extremely durable and fashion forward, carbon fiber is used to create luxury products including hats and wallets for a tough and contemporary style option. Carbon fiber is one way of future fashion. If he doesn’t agree, Brilliance provides a 30-day money-back guarantee, but we know he’ll be happy! Does he dream of Katz’s Delicatessen, the Yankees and the Guggenheim? His heart might be in New York. 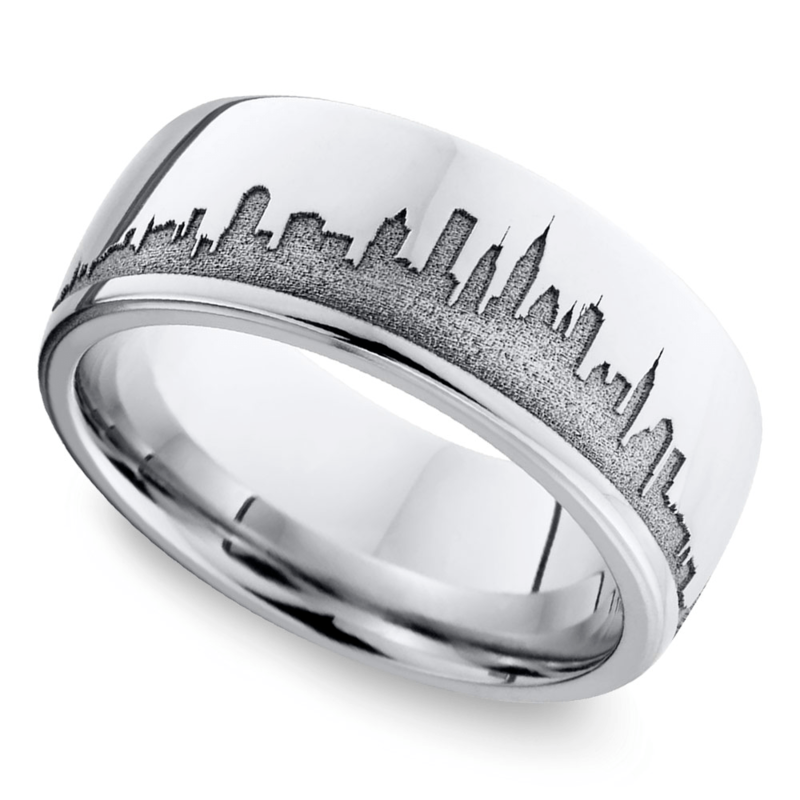 Channel his city-centric state of mind by linking his vows to the New York Skyline wedding band. The simple, classy ring is cast in cobalt and proudly displays the iconic city’s historic skyline. Koa means warrior, and the austere wood originates from Hawaii. Set within a band, koa wood is understated, strong, and elegant. The surfer, the architect, the carpenter, the everyman…a ring with koa keeps it low-key. 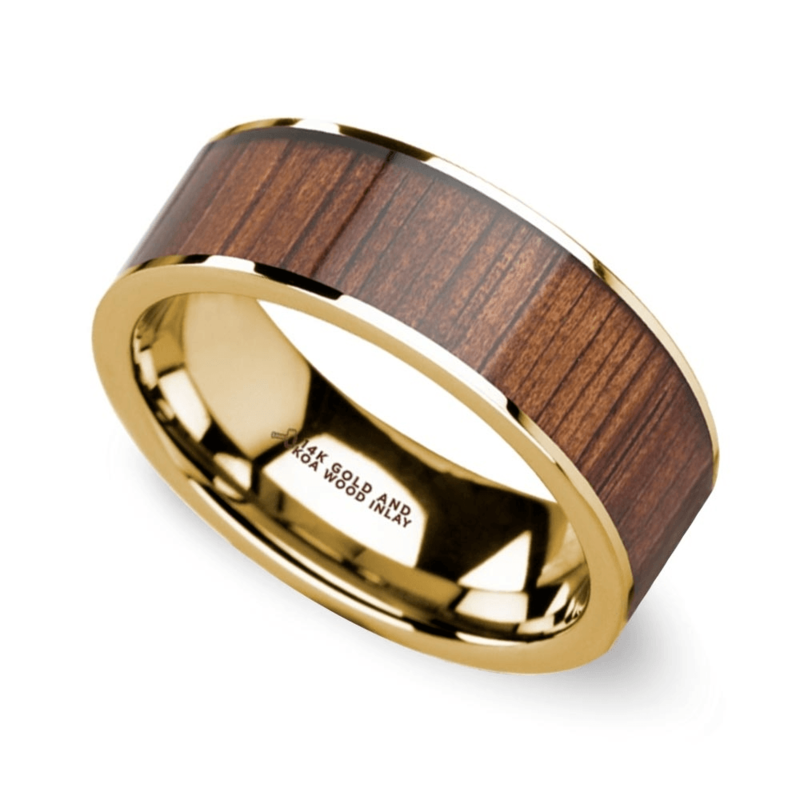 The wide koa inlay band features a thick inlay of koa placed within yellow gold to complement the rustic tones of the wood. While koa wood was once used to make canoes and weapons, we don’t recommend he use it to carve out a boat or channel his inner warrior. If he looks at his choices and he still feels a pull toward a traditional domed band, push him toward the something traditional with a bit of an edge. Damascus Steel originated in Damascus, Syria during medieval times. The metal was used for making knives and swords and features a wavy or swirling pattern within the steel. The offset rose inlay ring in Damascus steel features the durable metal accented with a rose gold band near the top of the ring. The look is unpretentious but stylish. The domed, classic shape blends into an edgier material for the best of both worlds. Whatever statement fits his style, the world of men’s jewelry has something to offer an unusually charming choice for a unique ring. Jump off the beaten path of the simple band and opt for cool, modern and completely nonconformist with an edgy material or unique design.